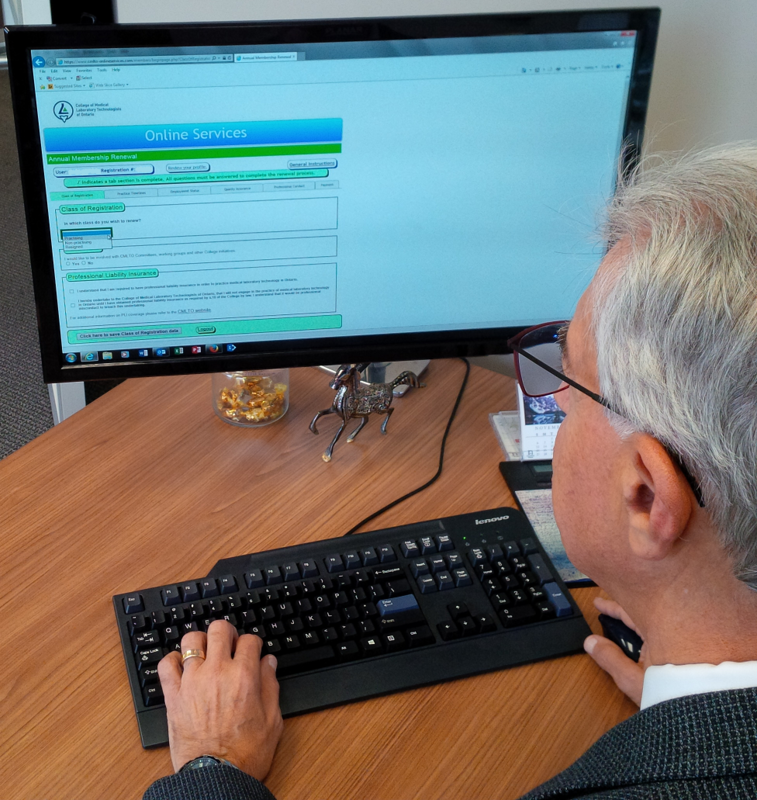 CMLTO’s Annual Registration Renewal for 2018 began November 1, 2017. All medical laboratory technologists registered in Ontario have been sent notification of the renewal requirements by letter mail, and must renew online by December 31, 2017.
Review step-by-step renewal instructions by clicking here. If you have questions, please call 416-861-9605 and press 1 for Registration and Renewal, or email registration@cmlto.com. CMLTO is hosting a webinar for medical laboratory employers and managers on November 22, 2017, from noon to 1:00 pm. Presentation topics include the CMLTO Voluntary Roster and mandatory reporting requirements. Click here for full details (PDF). A panel of the Discipline Committee of the College of Medical Laboratory Technologists of Ontario will hold a hearing on Thursday, December 21, 2017, commencing at 10:00 am at Victory Verbatim, 222 Bay Street, Suite 900 in Toronto. The hearing is being held to consider allegations of professional misconduct referred against Mahmood Khan, MLT who practices in Mississauga. Le Comité de discipline de l’OTLMO tiendra une audience sur vendredi le 21 décembre 2017, au Victory Verbatim, 222, rue Bay, bureau 900 à Toronto, à compter du 10h00. L'audience est tenue pour examiner les allégations de faute professionnelle portées contre Mahmood Khan, TLM, qui exerce à Mississauga. 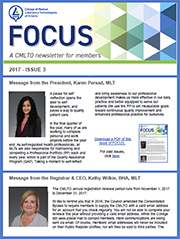 The most recent CMLTO member newsletter was released today via email. Read the current issue online here and back issues here. CMLTO’s Annual Registration Renewal for 2018 begins online on November 1, 2017. All medical laboratory technologists registered in Ontario have been sent notification of the renewal requirements by letter mail, and must renew online by December 31, 2017. Public Health Ontario has released new Labstracts: Syphilis (Treponema pallidum) serologic testing update and Respiratory viral testing algorithm. Labstracts provide important information to health care practitioners about clinical or operational changes in laboratory testing. These can include updates in specimen collection, handling, testing or interpretation. 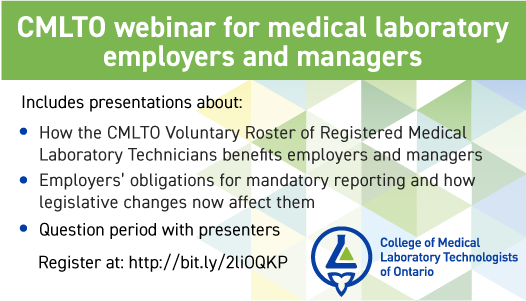 The CMLTO will be hosting a webinar for medical laboratory employers and managers at noon on November 22, 2017. Further details and registration information will be released soon. If you'd like to be notified directly, please email communications@cmlto.com. The CMLTO Council will be accepting applications from qualified MLTs who express interest in seeking the appointment of Academic Member on the Council. For eligibility requirements and other details, please click here (PDF). The deadline for Academic Member applications to be received by the College is Friday, October 6, 2017, 4:30 pm. CMLTO’s Annual Registration Renewal for 2018 begins online on November 1, 2017. All medical laboratory technologists registered in Ontario will be sent notification of the renewal requirements by letter mail on October 13, 2017, and must renew online by December 31, 2017. If you have questions, please call 416-861-9605 and press 1, or email registration@cmlto.com.